If you wish to organise an event let us have the details and we'll add it to the diary, thank you. 'Sportster At 60', British Motor Museum, Gaydon. 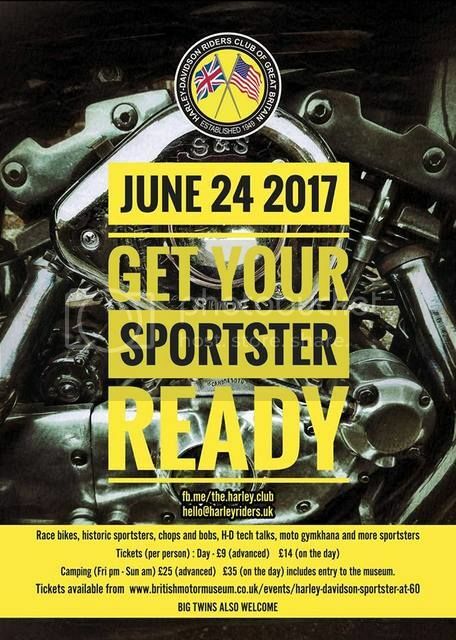 Have been in touch with the organisers of the Sportster 60th event today and they're very keen to have a Buell representation there if anyone is able to display their bikes. The event is basically one day - Saturday 24 June with camping overnight and Sunday morning for packing up and leaving. It's unlikely that I'll be able to make it on the Saturday but it should be a good event. It's organised by the Harley-Davidson Riders Club of Great Britain who are not to be confused with HOG. They are good old boys, generally proper old school motorcyclists and have always been very supportive of Buell. UKBEG has historically included a number of their members within our ranks. Step forward Nutah, Gipsy, Toyboy and Mr Waff. Have fun if you make it and if anyone wants to organise a stand PM me and I'll give you contact details for the organisers.